After much ado, Microsoft finally officially announced Windows 8 at its Mobile World Congress press conference this morning. Windows 8 has become increasingly important to Microsoft, a sort of reperations to address the consumer complaints and flaws of past operating system releases. Now the consumer preview download is available, and you can expect to find a whole new beast in Windows 8. The term the team tossed around most at the announcement was “fast and fluid” – two things even the most ardent Windows lovers might not be quick to call the platform. But Windows 8 is all about change and Microsoft is not shying away from making big moves here. President of Microsoft’s Windows Division, Steve Sinofsky, said Windows 8 represents a “generational change,” and that the last update of this significance was Windows 95 – which if you do your math correctly was 16 years ago. As can be expected, Microsoft offered a thorough look at how Windows 8 will translate between screens, unifying its tablet, laptop, and desktop presence. This means touchscreen or not, consumers will finally be able to find the same experience regardless of device, a division that’s previously plagued Windows users and kept Microsoft from seriously competing in the new wave of electronics flooding the market. Now your usage will move from screen to screen with you so you have a sort of permanence across devices: Microsoft showed how bookmarks, pins, apps, everything moves with you from your phone to your tablet to your laptop to your desktop. A big introduction and something that Microsoft has been mentioning for awhile is Charms. These are essentially icons that make it quicker and easier to get around Windows 8. Swiping from the right edge of a device, or moving your mouse to the upper right hand corner, reveals these Charms and their basic tasks – like Start, Share, Search, and Settings. Really, they’re just shortcuts, but they are easily identified and quick to get to. Windows 8 is also bringing apps to your devices via the Windows Store – all of which Microsoft announced will be free for the Consumer Preview. So download away. Windows to home. Hitting the Windows icon key will now take you to your home screen. Marrying inputs. 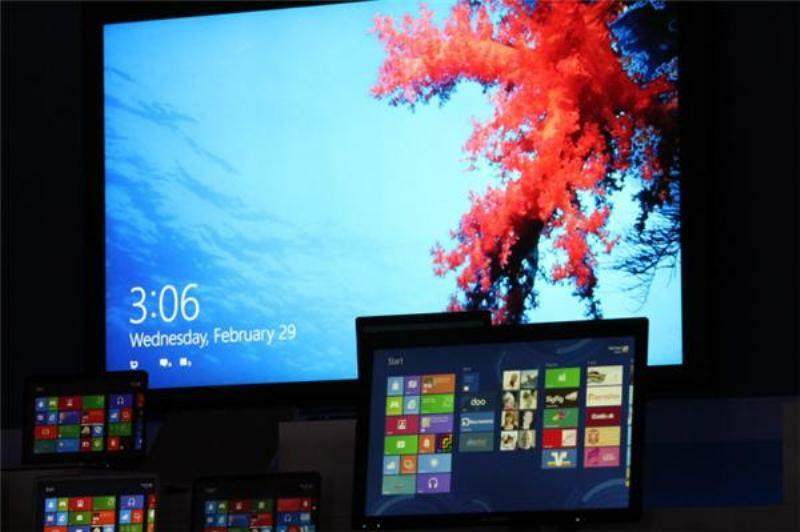 Windows 8 is essentially Microsoft’s first attempts to address how we use multiple electronics. Thankfully it’s not entirely isolating traditionalists and going all touch. You can use touch, a mouse, and a keyboard all at once if you like, something demoed during the press conference. Universal search. Microsoft has showed us this before, most recently at CES. Anything you search for brings up everything about it: video, Web, document results – you name it. SoCs. Microsoft announced Windows 8 will run on four SoCs: the Nvidia Tegra 3, the Qualcomm Snapdragon, the Texas Instruments OMAP, and the Intel Cloverfield. All apps are chip independent, so they will work on ARM or x86 – developers can use the same code. Rebirth of the Surface? Microsoft also brought out an 82-inch, Gorilla Glass Microsoft Surface running Windows 7 and claimed that up to 10 people could use it at the same time.